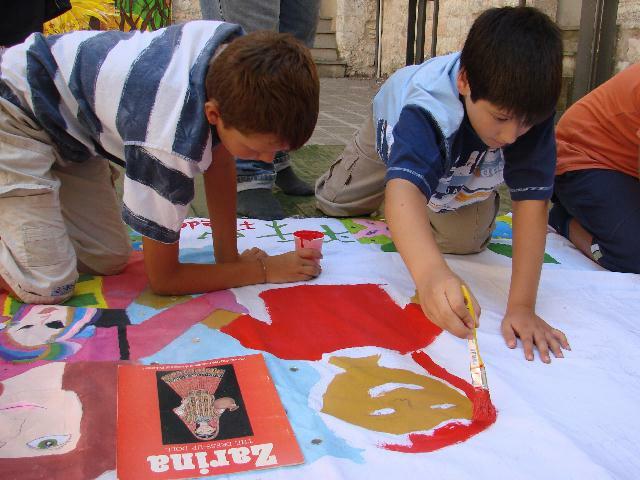 With an aim to promote peace and harmony among people in various parts of the world belonging to different religions, sects, races and cultures, the children of Islamabad started painting peace murals last month that have now been completed. 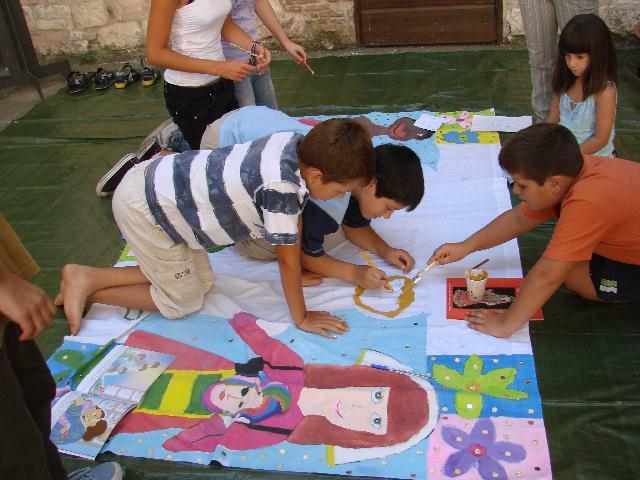 A group of children, comprising Hamza, Fatima, Sara, Zehra, Sarah, Faris, Shehryar, Dawar and Yawar from Pakistan painted children of France, Italy, Africa and Vietnam in their two murals on 'multi-cultural harmony' measuring 6x4 feet. In the process, they adopted different ways to express their strong desire for global peace, as words 'peace', 'salam' and 'amn' were written on murals in various languages, including Sanskrit, French, Italian and Japanese. The group worked on these murals in the studio of Fauzia Minallah, who also hosts the Funkor Child Art Centre, which has organised the event for global campaign 'Art Miles Mural Project' (AMMP) for universal peace and brotherhood through art. 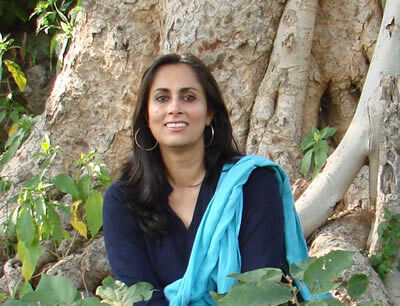 "We can make a difference through art at individual level, as this small group of children promoted the idea that Pakistan is not all about suicide bombings and extremism, but its people are peace-loving," said Fauzia. Both murals were partially painted by this group of nine Pakistanis while the leftout spaces would be painted by French and Italian children. 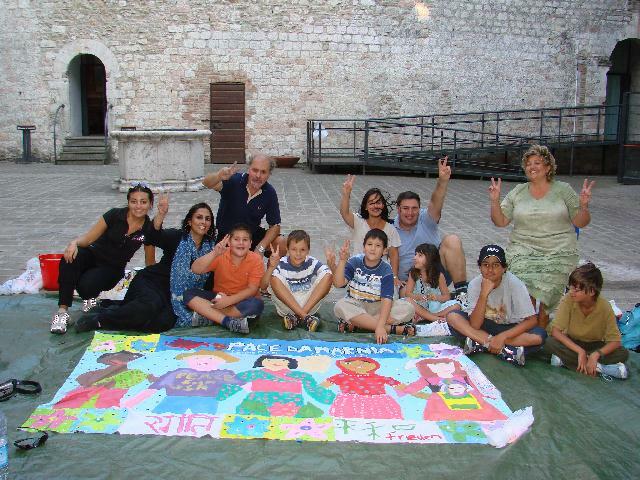 For that purpose, USA AMMP Italian Coordinator Giuseppe Fortunati organised an event in Italy for completion of murals at the spectacular fortress of Narni, known as Albornoz's Fortress. 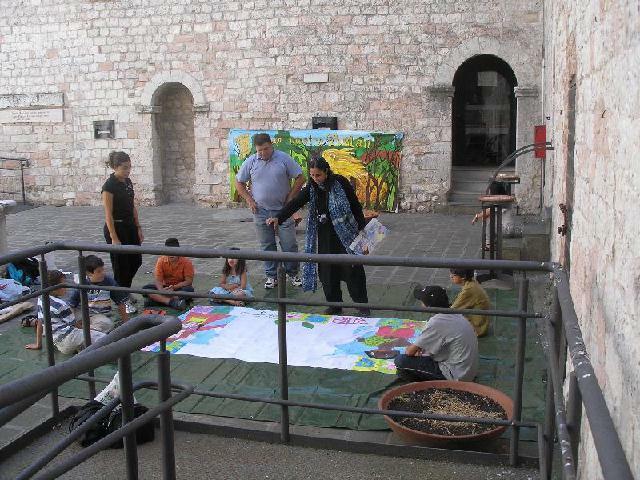 The administration of Narni gave special permission to Fauzia Minallah and Guiseppe Fortunati to complete the murals in the famous tourist site. 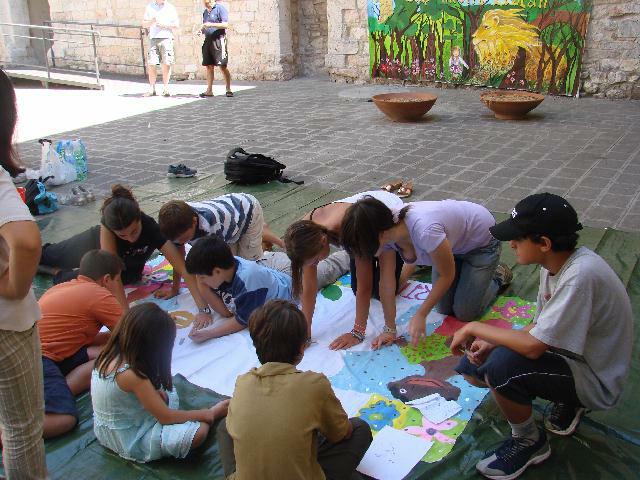 Equipped with paintbrushes and colours, the Italian children aged 10-15 years excitedly started completing the murals. 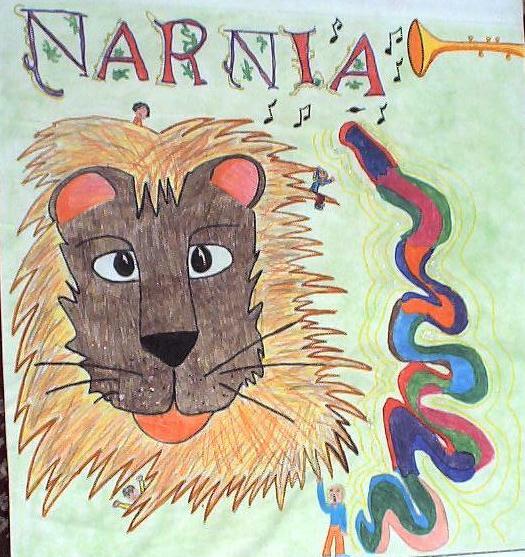 The older ones like Naomi and Vera sketched the main figures while the younger ones filled in by painting them.
. Narni is the magical city which inspired C.S.Lewis to write The Chronicles of Narnia, and now it has become even more famous after the Hollywood film based on the book. The children also painted an American Cowboy and a Chinese girl. Massimilliano also painted the face of the fascinating lion called Aslan, the statues of which are found in Narni and which is also a main character in the Chronicles of Narnia. Four years old Chiara painted a flower and then guided by her mother decorated the "Ghagra' 'choli' (traditional dress of the girl from Thar, Pakistan). At the end the mural was embellished by small mirrors which are used in the decoration of clothes in Pakistan. Luigi, Laura and Sonia offered the famous Italian ice cream to children. All in all it was a beautiful 'cultural' exchange thoroughly enjoyed by the children. Tourists and onlookers also joined us and soon there was 'Freiden' written in German by 2 young sisters, adding their own colors and messages of 'peace', giving a climate of contagious joy to this meaningful event. 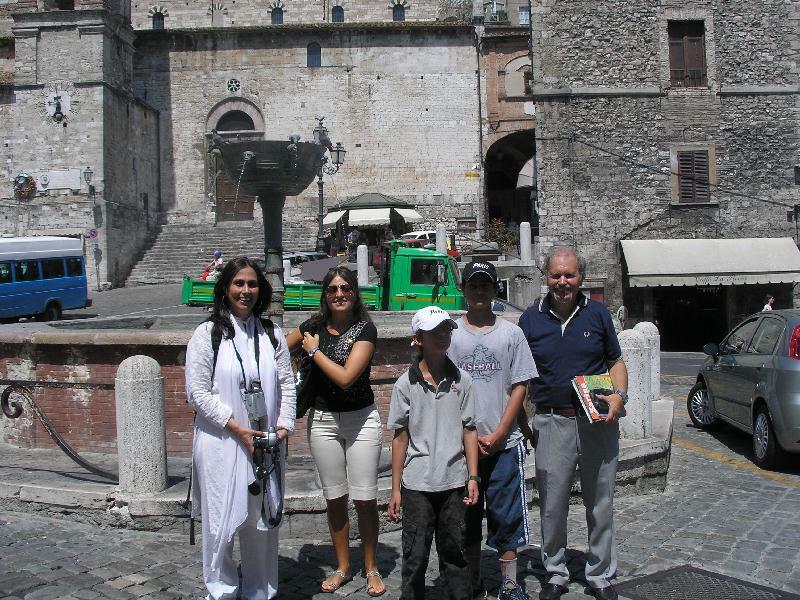 This cultural exchange was publicized in the Italian press. Amazingly, the murals, started by some children in Islamabad, travelled all around the world and were completed by multicultural children with messages of peace and harmony expressed in so many languages. These murals will be a part of the 'Grand Exhibition of Peace' planned by the AMMP in Egypt in 2010 and will be among thousands of other murals to adorn the spectacular pyramids. And now we have one more Mural for share the Pace message around the world .